Get up close and personal with several human and animal mummies. A mummy's revelations are important in understanding not just the physical characteristics of Egyptians from that era, but also the cultural and spiritual beliefs of an ancient society. 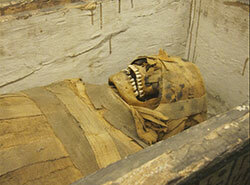 The first mummies were not created by man, but by the arid Egyptian environment. The Egyptians buried their dead in cemeteries located in the desert. The sand and the hot, dry air preserved many deceased individuals. They sought to explain why corpses remained intact for years, decades, or centuries after their apparent life-force had moved on. A then-reasonable conclusion was that the spirit still made use of their physical remains. Artificial mummification would arise over time to guarantee preservation. The luxury of an assured afterlife was very expensive however, and only about 8 percent of Egyptians could afford it. Upon death, the individual would be taken to a temporary shelter to be ritually washed and purified. After this first step of cleansing, the person is taken to the Per Nefer, the good house, where they would be embalmed. All of the organs of the abdomen would be removed, except for the heart, which was believed to be the seat of the soul and intelligence. The removed organs were then dehydrated with natron – a naturally occurring salt – for 40 days. After this period of drying, the organs were placed into Canopic jars. The abdominal cavity, once empty, would be stuffed with various aromatic plant materials, reeds, and linen. The exterior of the body was anointed with various oils and perfumes which invited the attention of the deities before being wrapped slowly and carefully. Amulets were sometimes placed between layers for further magical protection, and spells were recited throughout. After all preparations were complete, the mummy would be taken into their personal tomb by family. The mummification process was a long, intricate procedure that changed over time. The wrappings, amulets, and even coffin styles went through trends over the years. The museum currently houses four human mummies and over ten animal mummies on display. To meet those and others, please join us for our mummification workshop every 1st Saturday of the month at 12:30 pm!